The theme is a tribute to the late 2d/51d CARRIE / FISHER. There’s HELP ME OBI, CINNAMON BUNS, YOU’RE MY ONLY HOPE, PRINCESS LEIA, and WAN KENOBI, plus the circled letters (noncontiguous, asymmetrical) spell out STAR WARS in mostly awkward answers. It’s a quote theme (which is a thing I rarely like) done poorly, with the quote split in unfortunate spots and presented out of order (as well as broken up by two Leia-related non-quote entries). I don’t like TEST LAB (it’s … just a lab), ON A RUN, or WINS AT. It would’ve been nice to allude to the rest of Fisher’s career and life, and not what she did at age 19. She wrote books, you know! She was in other movies! She and her late mother, Debbie Reynolds, are also featured in a current HBO documentary, Bright Lights. Carrie Fisher is worthy of a tribute crossword for sure, but I wish this one had done her justice. The fill also includes the French ALPE and ALLÉE, which seem tough for a Tuesday, along with ‘TIL NOW, OLEAN, and IN E. Meh. A solver on Twitter had not heard of 50d. [In fine ___ (healthy)], FETTLE. Is this at all a regional thing? Fettle dates back centuries, so I suspect it’s pretty broadly used (though maybe not amongst the youngest generation). My mind is still boggled by the quote’s layout here. It wants to be read as “Help me, Obi, you’re my only hope. Wankenobi!” 2.25 stars from me. So … mashed potatoes! Cute! And the entry right in the dead center of the grid is MIXED UP [39a. Confused], which seems appropriate. 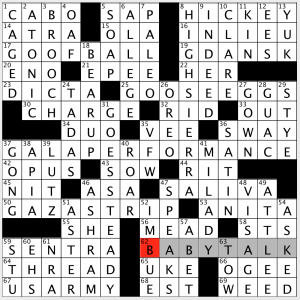 I always know going in that these Crossword Nation puzzles are pretty easy, but I actually had a hard time getting started on this one. I didn’t know ADELA [13a. “A Passage to India” heroine], GAPS didn’t come to mind right away [1a. Deep ravines], and I was thinking more along the lines of GI JOES than KEN DOLLS for [20a. Boy toys?]. I figured 1a was going to end in an S, and 23a would likely end with a D, so I kind of wanted 4d to start with SKIED, instead of the correct SLEDDED [4d. Coasted down a snowy slope]. Basically, I just moved on because nothing was coming together for me in that corner, which, I must admit, was kind of discouraging. But both TALL [5a. Starbucks latte size] and EDAM [9a. Dutch cheese] came easily so, my confidence restored, I was able to breeze through the rest of the puzzle. I did have to laugh at myself at one point. With G_AT in place for [52a. Zodiac animal], my first thought was GNAT, which is pretty funny/stupid. Thanks for hanging out with me again this week. 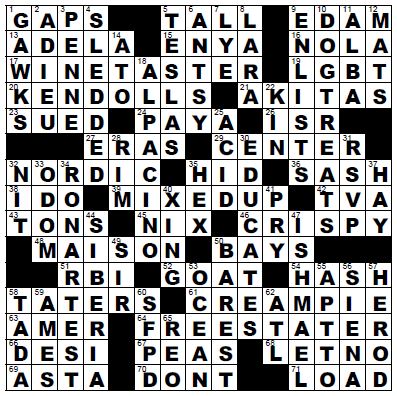 With any luck, Janie will be back for next Tuesday’s puzzle! I’m certain this is not a new theme, but we get a beautifully-filled grid today. The revealer is at 59a: [Winning hand, and a hint to the puzzle theme]. That is, a ROYAL FLUSH. Aside from those little nits, the puzzle is really nice. That is, unless proper names are your bane. I counted 13 first names, last names, and nicknames (KORS, PACINO, ANI, GERI, MIA, GRANT, MAISIE, EWAN, TERESA, OMAR, AIELLO, JOPLIN, A-ROD) and one river (ARNO). 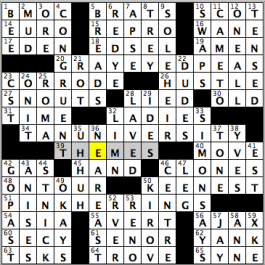 But if you’re okay with those, you get a lot of fun fill, especially considering there are already six full-sized theme answers. My favorites are GORGONS, GEISHA, JOPLIN, MAISIE, and ORNERY. Also good are GRATIS, ASPIRIN, QUARTET, and SPIGOT. The only thing that got me looking askance was 21a SNAGGLE. It’s clued as [Knotted mass] and is new to me as a stand-alone word. I have only ever heard it when preceding -tooth, -toothed, or -puss (i.e. the Hanna-Barbera cartoon cat). In summary, this is not a new theme, and the theme choices maybe aren’t as elegant as they could be, but they are colorful and evocative, and the rest of the grid is filled out with aplomb. Two pencils up from me. 17A AND 11D are my faves, the others, not so much, but still clever and original. I often like to try and brainstorm any other examples, but I got nothing, so that merits a tip of MY cap to Matt just for finding four symmetrical examples! For that alone, I will give this one a solid 4 stars! 6A [Zipped past] RAN BY – I had RACED instead. 33A [“Just don’t look nervous”] ACT CASUAL – Probably my favorite entry in the puzzle. Another common phrase used in a puzzle “casually” by Matt! 45A [Creator of “Community” and co-creator of “Rick and Morty”] DAN HARMON – Never heard of him. Also haven’t really watched either show. Never heard of Rick and Morty! But I am not cultured. I’ll have to see if it’s available On Demand or on Netflix! 51A [ __ en place (professional kitchen setup)] MISE – I think I have blogged about this entry before, specifically my lack of familiarity with it! 1D [“Unbelievable” band of 1991] EMF – I will add it here to embed the melody into your brain! 2D [Wrestler-turned-B-movie-actor Johnson] TOR – A better clue than [Jagged rock], but I don’t know him either! Maybe because he is before my time! 18D [Gives confirmation] SAYS SO – Or SAYS OK, or SAYS TO, like I thought it might be! 47D [Removes, as an opponent’s spine in “Mortal Kombat”] RIPS OUT – Eww! Another fun Jonesin’! Have a great week! Definitely a constructor I am not familiar with, but a fine puzzle nonetheless. Took me a minute to get the theme, but I’ll make it a little plainer for you! Get it? Baby talk is often spoken as “Goo goo ga ga,” although no baby has ever said those words! Very well done, and a nice “a-ha!” moment at the end. Not a challenging puzzle, but it IS a Tuesday! 3.8 stars. 1A [Baja vacation spot] CABO – As in Cabo San Lucas in Mexico, a popular vacation spot. 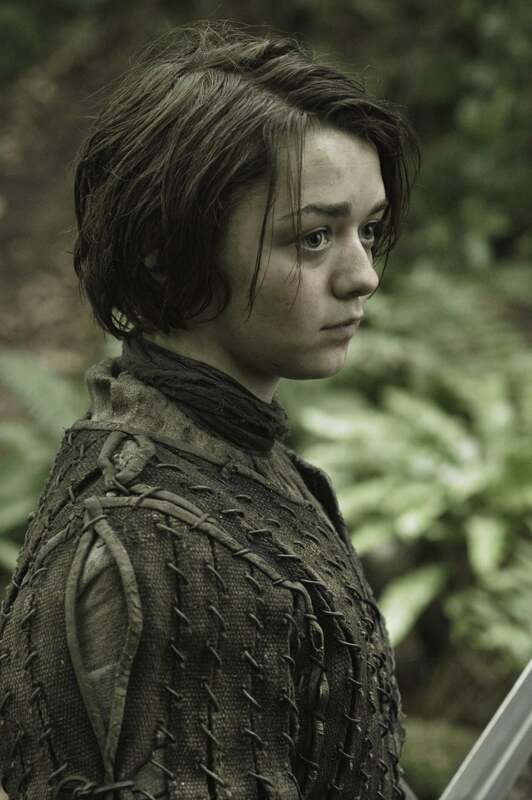 8A [Neck mark] HICKEY – Not the best entry; slightly bad connotation. 47A [Spitball need] SPITBALL – Along with the previous entry, there is a wee bit of squirming possibly, but that’s about my only complaint with this puzzle. And if that’s all I have to complain about, that isn’t much! 2D [Not accented, as syllables] ATONIC – More common is the word ATONAL, at least it seems that way! 8D [Bogart film set in a California range] HIGH SIERRA – Add this to the long list of movies I have never seen! 39D [Skating leap] LUTZ – You never know if it’s AXEL, LOOP, or LUTZ. At least it’s not SALCHOW! 46D [Traditional Hindu retreat] ASHRAM – A word I primarily know only from puzzles! 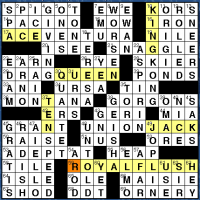 59D [Actor Erwin] STU – Definitely crossword famous! I have no idea who this fellow is, and I have seen him in puzzles for 40 years! Happy Tuesday! Enjoy your week! Good morning, people! We have a slightly harder than usual puzzle for today, with the grid brought to us by Mr. Randolph Ross. In it, phrases in which a color features in the phrase are given the dye treatment, as they become puns by replacing that color/word with a lighter hue. Outside of its question mark at the end, the clues are presented as if they are describing the actual answer. GRAY EYED PEAS (20A: [“I Gotta Feeling” band?]) – (The) Black Eyed Peas. TAN UNIVERSITY (34A: [Ivy in Rhode Island?]) – Brown University. PINK HERRINGS (51A: [Clues that mislead?]) – Red herrings. I wasn’t able to pick up what was going on until the “pink herrings” entry emerged, then the rest of the grid turned out to be not that difficult. Also, it helped to get James Brown out of my mind when seeing the clue for “gray eyed peas,” as I had “I Got That Feeling” in my head. (Honestly, I still have that James Brown tune in my head, which is awesome!) Part of the semi-difficulty came with a couple of the long entries, as I wasn’t able to get enough of its crossings to take a real good stab at it. Finally, SIMON SAYS (33D: [Words that encourage people to do as they’re told]) came after chopping away at the Southeast corner and SOLE HEIR (9D: [One who gets everything]) came when I finally convinced myself that “xerox” wasn’t the fill that needed to go where REPRO ended up being (15A: [Copy, for short]). I liked the somewhat misleading clue for SNOUTS, as I did indeed think about a type of pig instead of its anatomy (27A: [They smell in a pigsty]). All in all, it was a fun solve, and I did like a somewhat extra challenge that today brought…though I could do without LIMN to be quite honest (32D: [Describe]). “Sports will make you smarter” moment of the day: CENTRE (46D: [Middle of London?]) – Between 1973 and 1997, both the Washington Bullets (now Wizards) and Washington Capitals played their home games at the Capital CENTRE (spelled exactly like that) in the D.C. suburb of Landover, Maryland. The Capital Centre was known as the first American indoor arena to hang a video replay screen (a four-sided screen called the “Telescreen”) high atop its playing surface. Both the Wizards and Capitals (as well as Georgetown men’s basketball) moved into their new arena, now called the Verizon Center (a.k.a. my second home for the past two months), in the Gallery Place/Chinatown neighborhood in 1997, and the Capital Centre was demolished in 2002. See you all the top of the hump on Wednesday! This entry was posted in Daily Puzzles and tagged Alan DerKazarian, Elizabeth C. Gorski, Lee Taylor, Matt Jones, Randolph Ross, Timothy Polin. Bookmark the permalink. I rarely have an opposite reaction to a grid from Amy’s, but today, I thoroughly enjoyed Tim’s puzzle. This timely tribute was packed with theme material, I didn’t mind the splitting of the quote, and I don’t find any of phrases containing STAR WARS awkward. Yes, Carrie Fisher certainly went on to many fine achievements, but how much can you put into a 15×15? It would have been nice if STAR WARS were completely symmetric, but visually, it was very close. I thought it was pretty good, too. All the talk about what’s appropriate for early-week puzzles makes the Star Wars connection most fitting of all Ms Fisher’s accomplishments. Yeah, she did a lot of other things, but, c’mon, nothing topped her iconic role of Princess Leia. Without doubt, that’s how she’ll be remembered and rightly so. I wish I had accomplished so much at age nineteen. 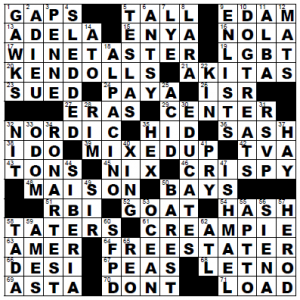 As for the puzzle, per se, given the saturation of theme entries, the rest of the fill was noticeable for its lack of dregs. Also: Doesn’t TEST LAB distinguish itself from, say, photo lab or research lab? On a different note, do I have to get Martin H out of bed to get the Jones puzzle? I think he hosts it on his server. All I get is “Page Not Found”. Same here. I was absolutely delighted by all the references. 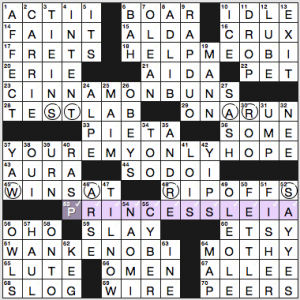 I got “Carrie Fisher” really quickly, and thought that would be it. Then got the “Cinnamon Buns” and “Princess Leia”, and thought that was all there would be in terms of theme. Then was shocked to find the long quote (out of order, but who cares? Not me) plus the circled letters. PLus some other references like “Icy” Hoth and “It’s” a Trap! Sure, some of the fill wasn’t great, but also it’s Tuesday so what do we expect? I give it points for really going for the theme. 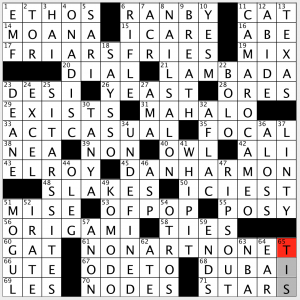 Must admit I was confused by the out of order quote, but I see the clue gave it in the right order; 61 and 37 across, which should have given me a clue. I didn’t mind ON A RUN. I think that’s a pretty common way of saying that someone is on a hot streak at a blackjack table. I’m surprised that was a debut answer, tbh. I suspect 99% of solvers have never been at a casino blackjack table. On a roll, on a streak—these are the phrases that pop up in all sorts of other settings. ON A RUN doesn’t seem to be used broadly at all. I have been at a blackjack table and I thought that was awkward. I hve heard “roll” and “streak” but not “run.” “ON A RUN” to me is someone who has gone out jogging. And not even really that. Minor nit on the WSJ 37D: I don’t think it’s been possible to purchase a TEN SPEED bicycle in more than 20 years, so seeing that clue with some implication of being obsolete would seem to be appropriate.